Happy Wednesday ladies! 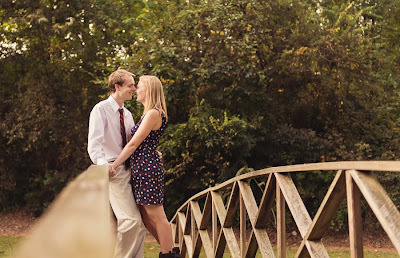 We typically post our popular Wedding Wednesday posts during the months of May and June... However, with this cold front moving in, we just want to curl up on the couch under a blanket and look at pretty pictures and read about great Clemson love stories...don't you? So by popular demand, we are bringing Wedding Wednesdays back for the rest of this month and possibly into December. 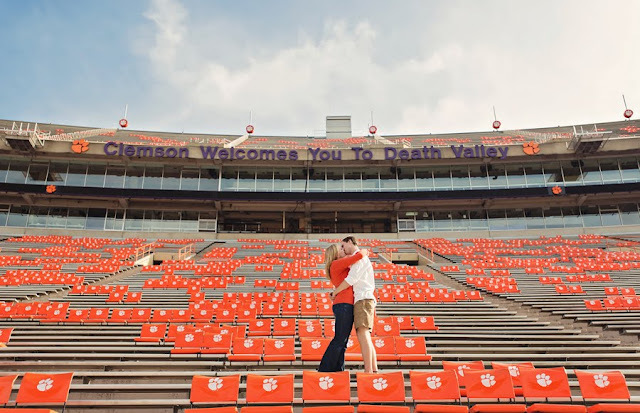 If you have a Clemson wedding or engagement session that you would like to share, please email us at clemsongirlblog@gmail.com! 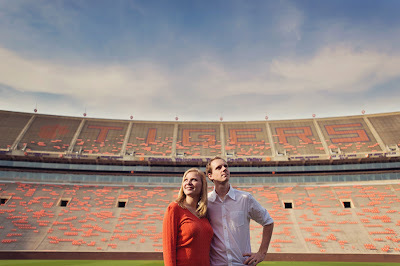 Today we get to share Hall and Alex's Clemson love story and engagement photos. Photos were taken by the talented Julia Laible Photography. You can swoon over more gorgeous photos on her Facebook page too. 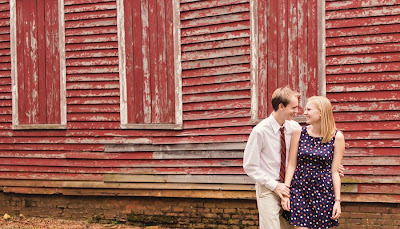 Hall is a senior History major at Clemson, graduating in December. Alex is also a senior at Clemson, graduating in May with a degree in Geology. 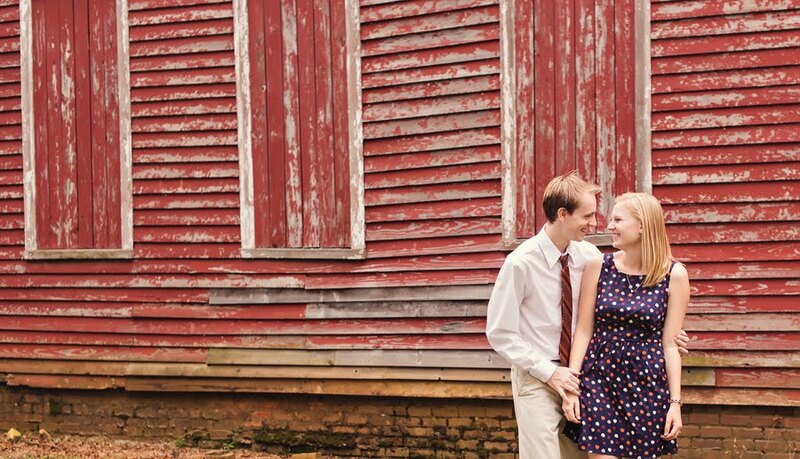 The two met through mutual Clemson friends at a friend's lake house, but connected more when they went to go see Harry Potter and the Deathly Hallows movie premier. Hall: "On February 15, I woke up to a note and a daisy (my favorite flower). Alex came by around 9am with bagels and we watched a Harry Potter movie. Then, we went to the Dike and had a picnic lunch where he had a box filled with old love letters, notes, movie tickets, and other mementos. Then, he took me to our favorite camping spot where he had prepared our "story" in a journal, and finally took me to the bridge behind the Strom Thurmond Istitute where he proposed!" Clemson has played an important part in the couples' relationship... they met in Clemson, got engaged in Clemson, and will soon be married in Clemson. Some of their fondest memories are from Clemson games and running along Clemson's campus. The wedding is scheduled for June 2013. 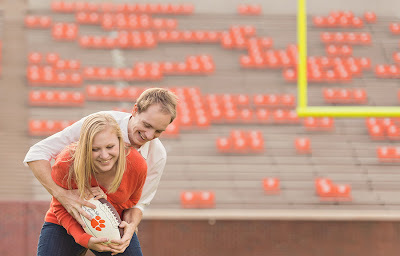 Hall's parents were married in Clemson and soon Hall and Alex will also be married in Clemson. The couple's love for Clemson will be present in many ways on their big day. The accent color for the wedding is purple, with some orange possible thrown in the mix. Also, the Tiger will be at the wedding and Hall's garter will be Clemson orange. We can tell from these photos that this super sweet couple is madly in love - look at all that kissing! :) Big thanks to Hall and Alex for sharing their story, and a thanks to Julia Laible Photography for sharing the photos.